You must be a member of the Munich Skittle/ Kegeln Group to attend this activity. Would you like to join this group? 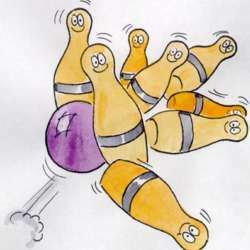 We organise regularly our event Skittle (Kegeln – mini-Bowling). If the bowling-balls are to heavy for you, we have a good alternative. If you are a beginner or not, don´t worry, we will be happy to help. We want just have fun! Normally we have one skittle alley (minimum 2 hours) / price 12 Euros per lane/hour (divided by the number of participants). There are many funny games possible: you will discover it with us! During the skittle-time it is possible to order something to drink or to eat. The kitchen in the Protected content is very good! And on Monday it´s BURGER-DAY!